This Double Pumpkin Granola is packed with sweet fall flavors and is a simple way to spruce up yogurt, breakfast cereal, and oatmeal. Mix the dries and the spices in a large bowl. In a small saucepan, bring the wets to a low-medium heat, whisking until you have a warm, well-blended sauce. Pour the sauce into the dries and quickly mix until everything is evenly distributed. Spread the mixture onto a parchment paper-lined baking sheet. This should be in a relatively thin, single layer, so you may need to work in batches or use multiple baking sheets. Bake at 300 degrees F for 25 to 30 minutes, or until the top is browned. To ensure even baking, either stir about the granola halfway through (→crispier but small chunks) or rotate the pan (→bigger chunks). Allow granola to cool completely on pan before storing. 1) If you have pumpkin seeds straight from a pumpkin and want to use the whole seed, boil them for 10 minutes then let them dry on a paper towel. This method is going to be a bit chewier and way higher in fiber. 2) If you have whole seeds and want to use only the pepitas, gently roll them with a rolling pin to crack the outer shells. Place them in boiling water for 30 minutes. Shells should float to the surface while the seeds should sink (you may also need to pinch out those remaining in their shells. 3) You can also just buy pepitas. 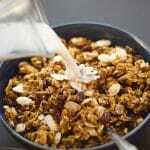 Recipe from Live Eat Learn at https://www.liveeatlearn.com/double-pumpkin-granola/.